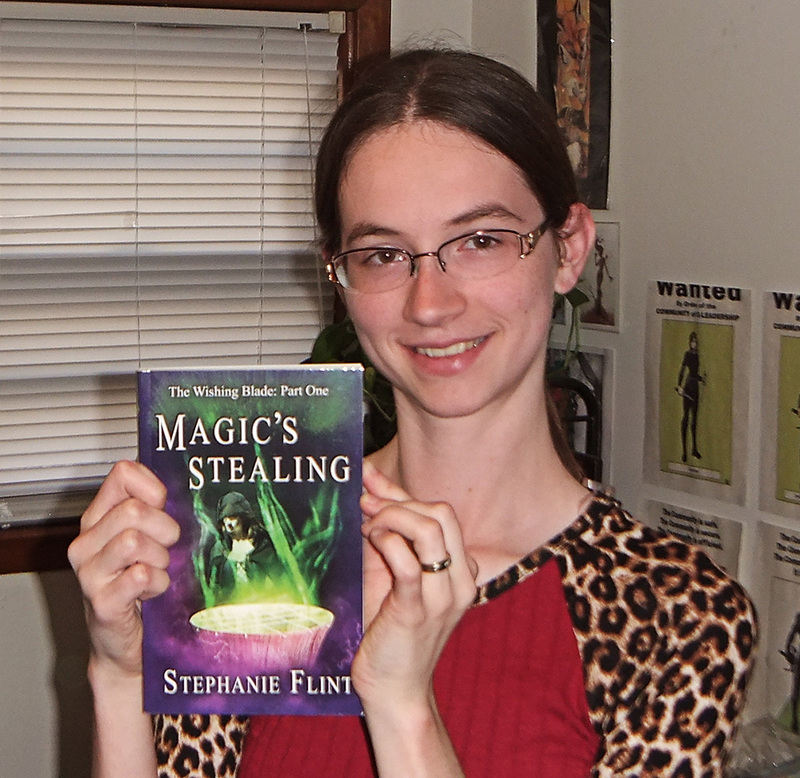 Thoughts on Publishing – Magic’s Stealing – The Paperback Proof Is In! 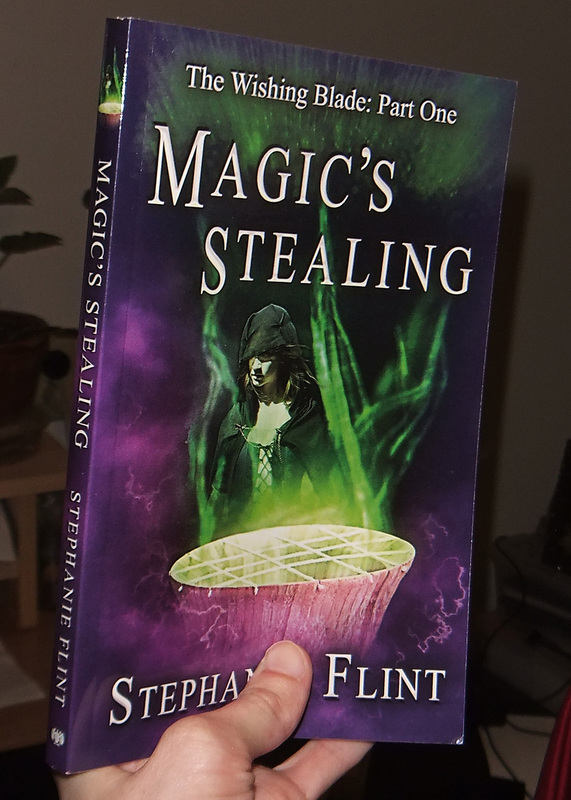 Today I’m going to interrupt my usual post with an announcement: I have received my paperback proof of Magic’s Stealing! Anyway, this book has 158 pages of content, plus additional pages for the front and back matter, and it clocks in at 170 pages long. Here you can see the the title page (there’s a few pages before it), and further down this post are samples of a chapter page and a regular, full-text page. You can click the images to see them at a larger size. I did all the formatting in Microsoft Word 2007, and I hope to do a post later on some of the fun tools you can use to add a professional touch to your books. 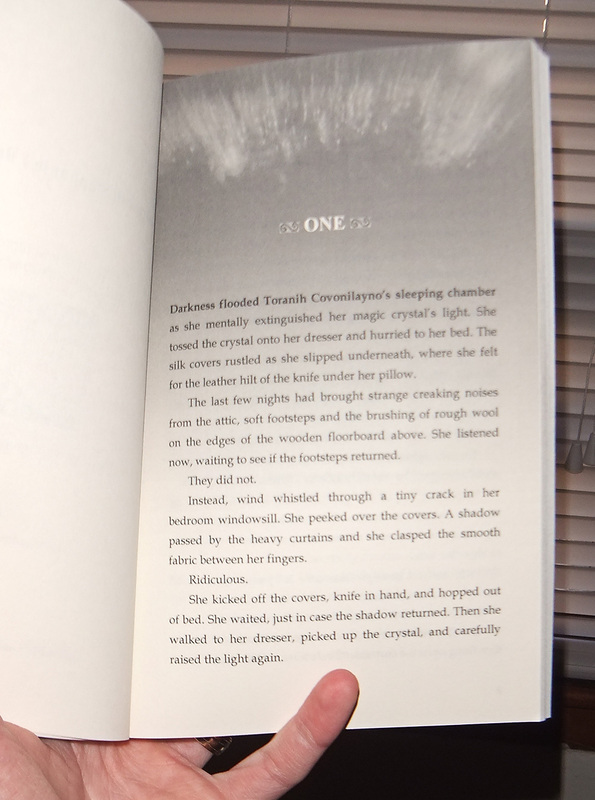 Once I tested a few pages out on my printer for various fonts and sizes and line spacing, I saved this as a PDF, and checked it in the digital proofer on Createspace. Once that looked good, I ordered the print edition. 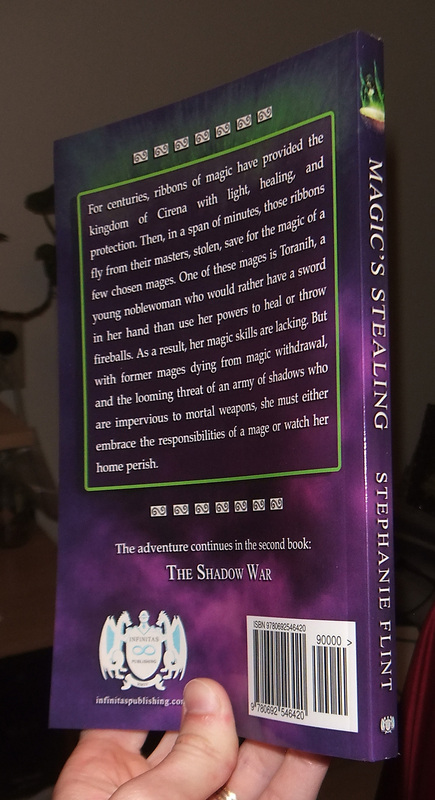 This particular book is 5.25 x 8 inches (based on a few of my favorite books with easy-to-read formatting), which uses the same dimensions as a 6 x 9, so the cover converted easily. Glossy cover and black-and-white, cream pages. I chose the “bleed” option so that I could use the full page image treatment (pulled from the background of the cover) for the chapter intros and title page. I did notice that the words got a tad bit close to the gutter, so that’s something I’ll have to keep in mind for future series, but it’s still readable. Of course, I also justified the text. This is the end result, and I’m now reading through the book to make sure the formatting is correct before I release the print edition (Amazon only, for now). I’ve found a couple typos, which I’ve made note of, but if those are all I find, I will most likely let those slide for now so that I don’t potentially mess up the formatting right before ordering a large number of books. If I find a large number of typos, I may go ahead and do the initial revision now. I don’t know. Maybe I’ll order a second proof, that way I can be sure the formatting looks right and that there are as few errors in the print book as possible. Anyway, regardless of what I choose to do, I plan to go back and revisit both the print and ebook editions at some point for typos, but I’m considering doing that all at once, when more typos have inevitably been found. 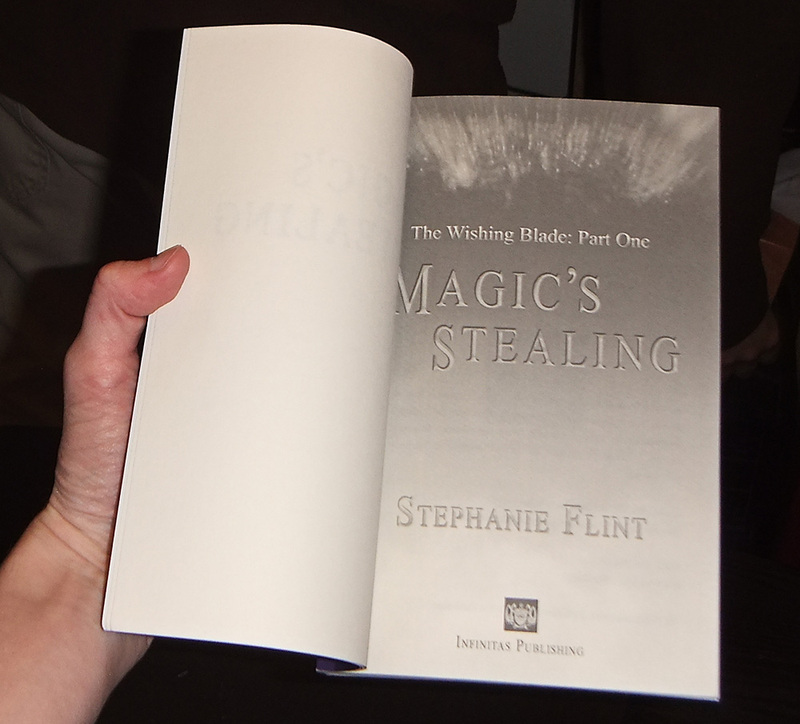 Have you had any experiences with proofing a print edition of your book? How do you decide when to update for typo corrections? I’m really enjoying the Kindle version. I’m fond of the characters, have a stake in their safety, and am enthralled by their world. Magic is everywhere, but I don’t feel lost at all. You’re very talented, Stephanie. I’m hooked on your style. 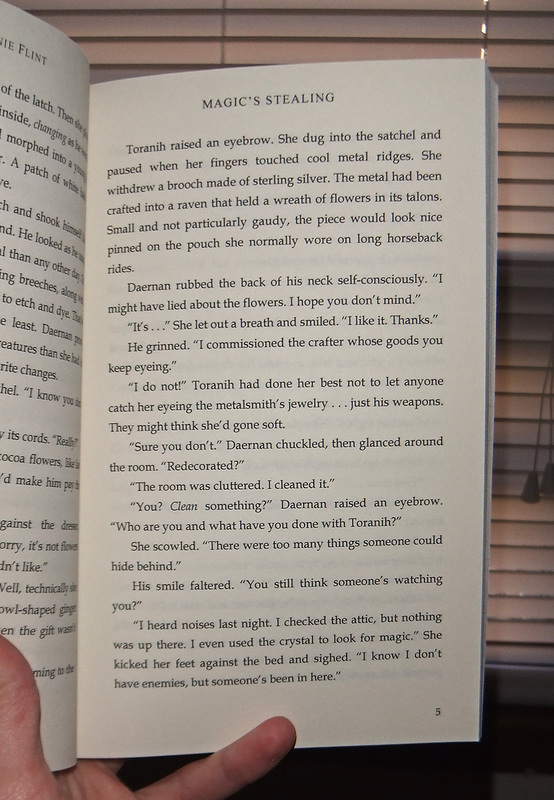 Like the chapter pages a lot.